Apartment hotel *** in the 1st district of Budapest. Address: 1016 Budapest, Hegyalja u. 23. Hotel Charles is a unique apartment-hotel on the Buda side of the capital, right by Gellert Hill, towards the Castle District. 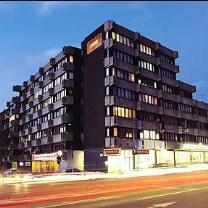 Hotel Charles is situated at a 15-minute walk (or two bus stops) from the Danube. The heart of the city on the Pest side, with the pedestrian-shopping street: Vaci utca, can be reached by crossing the river on Elisabeth Bridge. The three-star hotel offers a convenient location, comfortable accommodation, and guest-oriented services. Accomodation: Hotel rooms fall into two categories: standard and deluxe. The former category reflects simple but comfortable three-star category standard. The latter, however, the deluxe category includes rooms that were recently refurbished in a style that equals a four-star standard. All rooms are studios, which means that they not only include a bathroom and a bedroom, but a fully equipped kitchen as well. There are adjoining rooms for families, double rooms with twin or double arrangement (these can be booked for single use as well), and triple rooms with three full-size, regular beds. Restaurant: The hotel includes a high standard restaurant, offering International and Hungarian cuisine. Guests are welcome to a hearty buffet-style breakfast in the mornings. In the afternoon, and into the night, the restaurant is available for a great variety of a"la carte dishes, matching wines and drinks. Part of the restaurant can be separated to form a meeting room. From Spring until Fall, terrace seating is also available. Services: The hotel offers a wide range of services, including air-conditioning in the deluxe category rooms, free WiFi Internet connection in the rooms and in the public areas, closed parking in the court (surcharge applies), a business centre, around the clock reception with a multilingual staff, dry cleaning, computer rental and child care upon request. All services are carried out with a friendly approach and a helpful attitude. Public transportation: Hotel Charles has excellent public transportation conditions. The downtown or the subway can be reached with a 3-minute ride on bus no.8, 78 or 112, arriving every five minutes almost the entire day. Guest arriving from highways M1-M7 can reach the hotel in 2-4 minutes from boundary of the city.